There’s been community outrage in Papua New Guinea’s Bougainville region at the local government’s new mining plan. The autonomous government of Bougainville is planning to re-open the long shut Panguna copper mine and operate it with a company majority owned by Bougainville. It is expected to pass amendments to the Mining Act to accommodate the Australian investor who will jointly own Bougainville Advance Mining. Johnny Blades has been following the reaction to this development in Bougainville. JOHNNY BLADES: The plan comes after squabbling over who should get the licence for the Panguna mine, which of course has been mothballed for a long time. There’s been a government moratorium on any Panguna development because it’s all so sensitive around this impending the referendum on independence coming up this year. But the Bougainville President John Momis has described this deal with the Australian investor as the best deal for landowners, also saying that existing companies already mining in Bougainville would not be affected by this new deal. But this company, Caballus Mining, owned by West Australian businessman Jeff McGlinn, has no public profile to speak of in the industry. DG: So the president of the autonomous Bougainville government, John Momis, he earlier told RNZ Pacific that PNG’s central government is not stumping up with funding for the independence referendum, and they in turn have been on the urgent look-out for funds. Is he just turning to this investor or this deal to fund the referendum? JB: He seems to be saying that, that this is something they have to take up because of this urgent need for money. 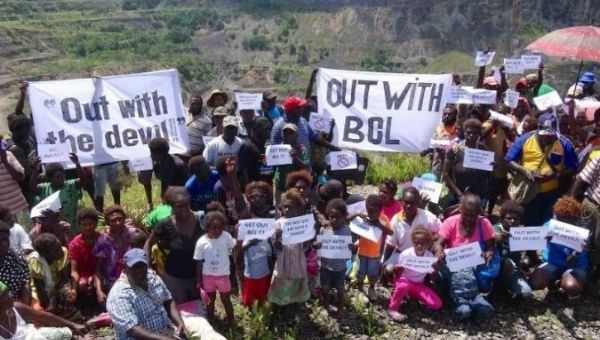 But one of the principal landowner groups in this area, the Osikaiyang Landowners Association has said that Caballus has no assets but is demanding a monopoly on all major large scale mining projects in Bougainville. There are questions over the viability of finance for these mining plans. They suspect this is a con job, that Momis and his government are being taken for a ride here. Lawrence Daveona, one of the association’s people, he said some of the ex-combatants on Bougainville had met with this investor Jeff McGlinn and asked him ‘are you able to give the government money?’ and he reportedly said to them no, he has no money. So it seems a bit fanciful to think that the investor or this deal might fund the referendum. DG: There was a public forum to dicscuss this issue in Arawa. What was the general feedback? JB: The community is upset that local parliamentarians seem to be rushing changes to the Mining Act through without proper public consultation. They says that you have to have proper public consultation before any social license is granted, so to speak. There’s a group called the Bougainville Hardliners Group. They have warned that sort of foreign control of mining on Bougainville is what caused the island’s civil war in the first place. So they and others are certainly opposed to diving headlong into this deal as Monmis and his government seem to be doing. DG: Historically of course, Bougainville Copper Limited has been behind the scenes of the Panguna mine, What’s been their reaction to this? JB: Unsurprisingly, BCL have come out very strongly against this deal. They’ve got their own agenda to push, of course. Let’s not forget that the moratorium on mining at Panguna was centrally because landowners oppose the return of BCL. But in this case, both landowners and community groups appear to agree with BCL that this deal seems to be risky. There are constitutional and ethical questions around it. And more widely, these bills are being interpreted as both anti-competitive and anti-investment which BCL and others are saying is the last thing Bougainville needs.